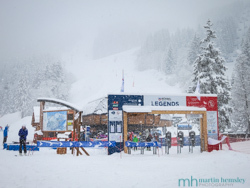 Following on from my previous blog post about the Meribel FIS World Cup Finals recently, the ski races have been and gone already. I was able to catch snippets of some of these events, and it all looked amazing. The television coverage looked fabulous as well, along with very positive Social Media feedback. So I'm convinced the whole event will have had an encouraging impact on both the visiting spectators and the TV viewing public. 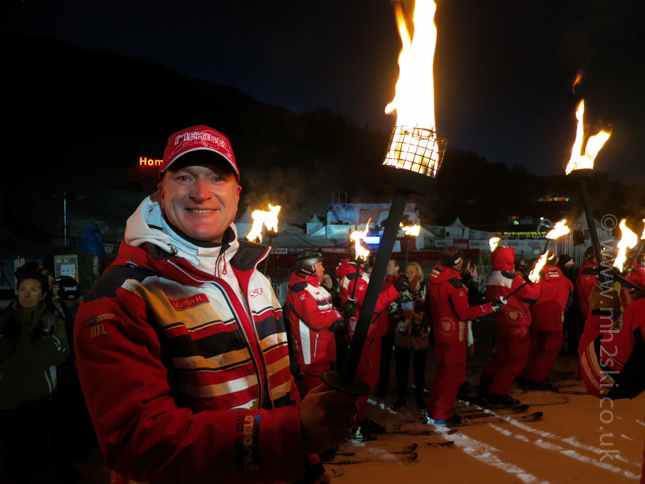 Although I was instructing (a very entertaining group of people from Yorkshire) during pretty much the whole event, I managed to sneak in a quick taster of the fun by taking part in the open ceremony, ie a Torchlight Descent. 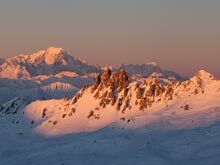 As a member of the ESF (Ecole des Ski Francais) here in Meribel, we are asked to take part in these descents several times each winter. For example Christmas Eve, New Years Eve, Russian Orthodox Christmas and any other special events through the season. And let's face it, the World Cup Finals opening ceremony was right up there in terms of special events. So I volunteered, and dutifully appeared at the Plan de l' Homme chairlift at 17.45 in order to be whisked up the mountain. But the thing is, it doesn't become dark in the middle of March until about 19.15, so what were we to do during all this time? As soon as we skied to the 'meeting point', it soon became clear. We were met by the most amusing sight. It was as though we were at the film set for a Harry Potter movie! In front of us was a huge smoking cauldron fuelled by burning logs. And what was bubbling away inside? Vin Chaud. What a fantastic welcome and start to the evening. At the best of times, waiting for the sunset before skiing off into the darkness is a fun and bonding experience with colleagues. However steaming hot Vin Chaud enhanced this period even more. Here are Michael and I (hiding behind camera) enjoying the moment with a toast. Then another unusual appearance took place. 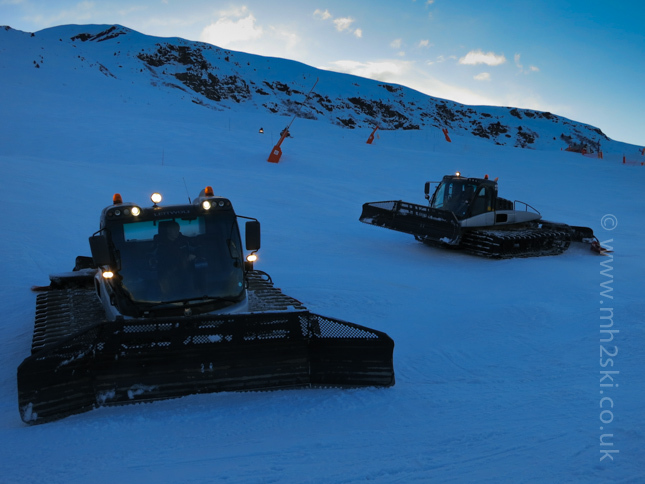 In the distance we could hear a few piste bashers heading our way, nothing odd about that bearing in mind the Three Valleys ski area has over 600 kms of pistes that need grooming. 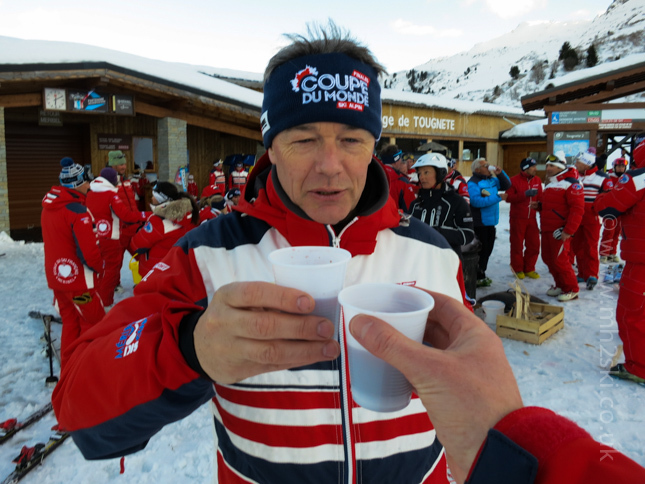 However they came closer and closer, we quickly checked that we hadn't left our skis scattered across the piste, and they still got closer and closer.... To the point that they got within twenty metres of us, parked up beautifully, and then the drivers jumped out of their cabins and joined the party! How cool is that? Pisteurs whizzed up and down on their skidoos and came and said hello. 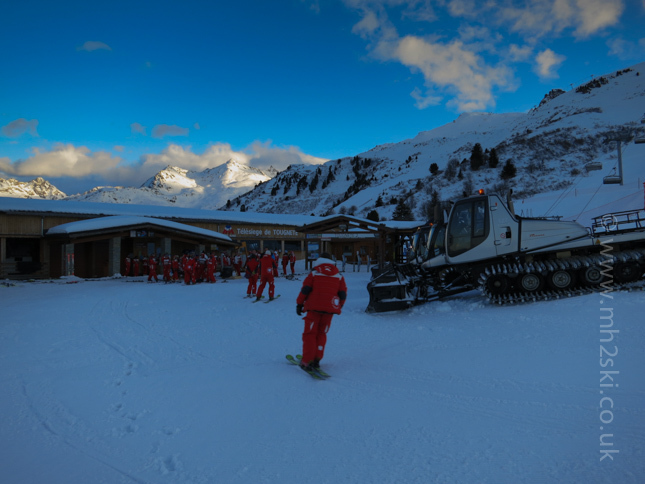 More and more instructors arrived in the fading light just as the chairlift closed for the night. We were all left high up on the mountain enjoying this moment. 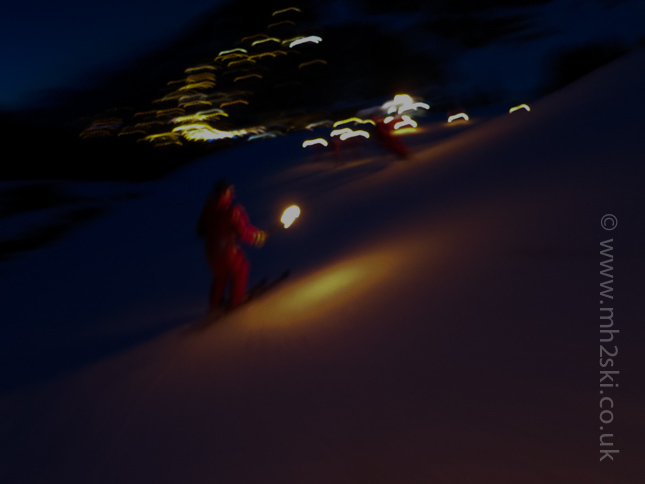 Sometimes you never know who takes part in the Torchlight Descents until everyone is up at the rendezvous point. It was especially nice to bump into a friend and fellow British ESF Instructor, Suzy Saunders. 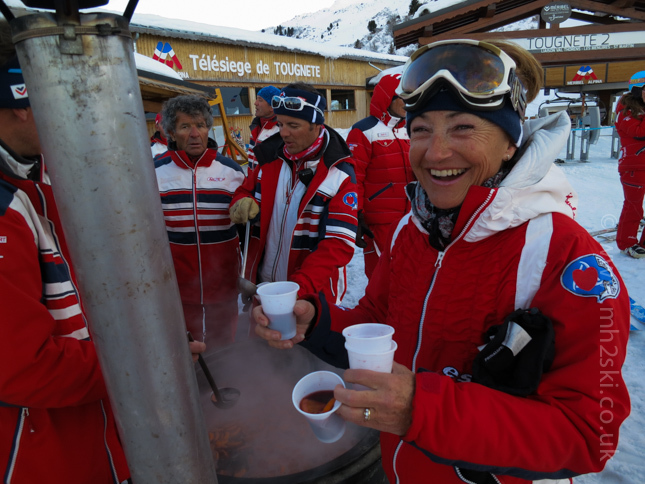 Can I just add that all of the Vin Chaud Suzy is holding wasn't for her, some were top ups for others !?! Gradually the light faded, and we started to get organised after our refreshments. Firstly you have to find your skis in the dark. Then find someone who has flammable gel that helps set your torch alight. Here is Michael ready to go. It's around now that the tactics start. You try to figure out exactly when 'the off' will be. Whilst looking around, and trying to avoid other people's flaming torches, you attempt to position yourself amongst other like-minded people, ie away from potential pickled types that could be a hinderance. That's the general idea, but if truth be known, all of that is blown out of the water as soon as the whole mass of flames start moving downhill....... and then you are off. Every man and women for themselves kind of thing! 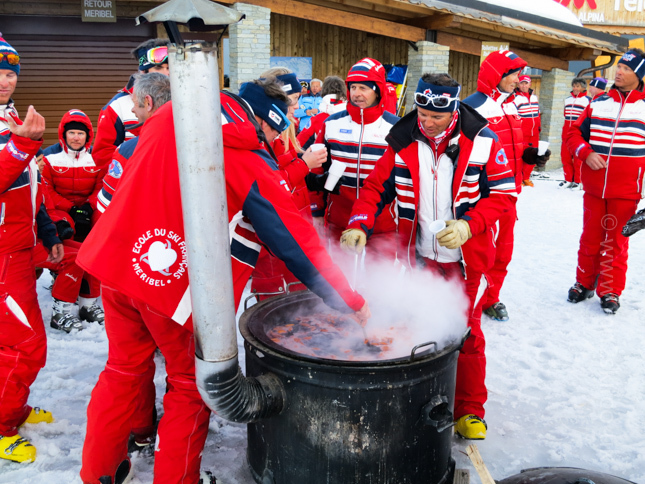 Now then, whoever led us down the piste had either drunk way too much Vin Chaud, or they were current or recently retired FIS World Cup skiers! 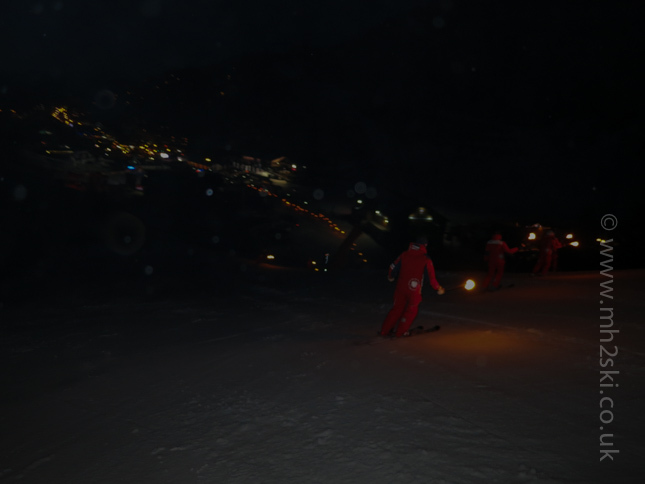 We were flying down the piste in the dark, at a pace I'd never skied at before during a Torchlight Descent. It's tricky enough skiing during the descent without trying to stay in touch with the skier in front of you at speed. I'm often asked by clients to describe what the experience is like. 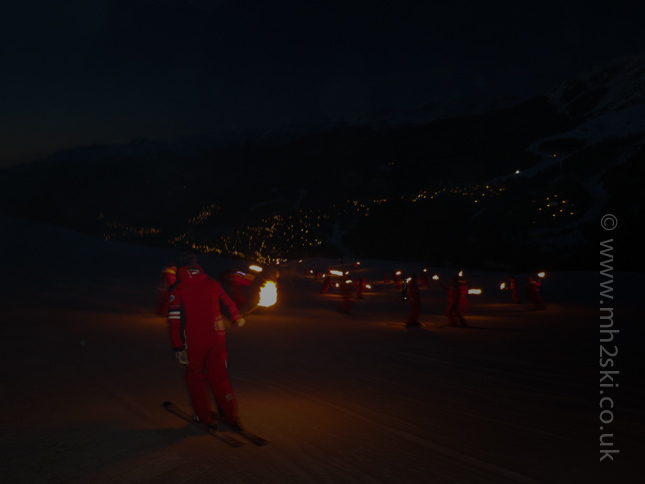 In summary, what you do is try to use the light of the torch of the skier in front, to help you figure out what the terrain is doing. 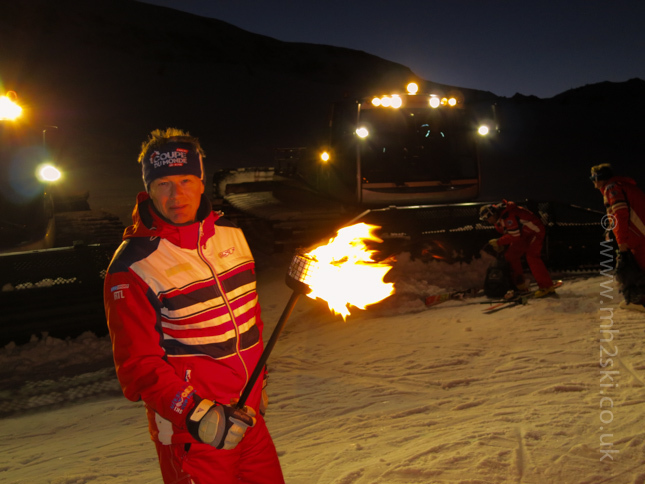 The light your own torch provides is next to useless for youself, it is only ever helpful to the skier who is following behind you. You daren't look behind you to see how close they are, but you know they are there because you hear their skis slide over the snow, and hopefully not too close so that they clip you. 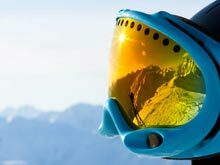 All this is going on whilst you are trying to stay close to the skier in front of you. If they get too far ahead, there is less light, and you have to cut the corner to catch up. This of course is poor form because it is less of a spectacle to the audience, they don't want to see skiers going in a straight line. 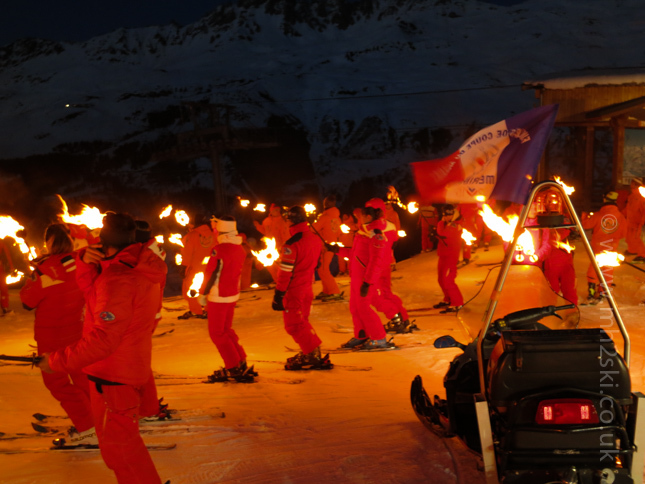 I hope this begins to explain what it's like to take part in a Torchlight Descent. It is great fun, with a mixture of emotions being adrenalin but also serenity at the same time. Apologies for these photographs being a little dark.... that's because it was dark! It wasn't until just as we arrived towards the bottom of Chaudanne that we realised how many spectactors there were, it was mobbed. I guess it was an opening ceremony after all. Fortunately the crowds moved to the side, just like Moses parted the Red Sea, and allowed us to form our own narrow corridor. 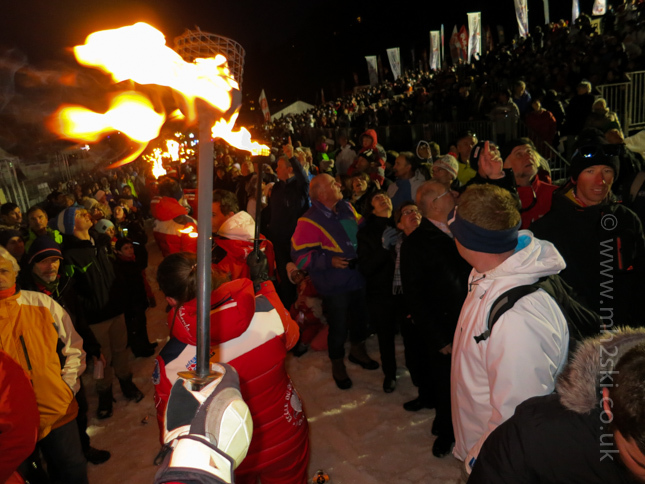 It was such a party atmosphere and great to be part of, with loud music, parapenters and fireworks. Whilst I was trying to keep my torch steady and not burn anyone, and take photos at the same time. I felt a tap on the shoulder, with a spectator offering to take a photo of me. So here, Ladies and Gentlemen, is proof that the author of these blog posts does actually exist. Whoever you were that kindly took this photo, thanks very much. After this moment a few people came up to me and asked to pose with the torch and have their photos taken. There was a real carnival atmosphere. On a final note, I can only apologise to those baffled skiers the very next morning at the bottom of the Tougnete 2 chairlift. The red stains in the snow wasn't spilt Vin Chaud from the night before, honestly. Apparently a film crew were up there shooting the next Harry Potter spin off film, which required experimental potions and lotions to be mixed under the alpine stars. That's what I heard anyway. 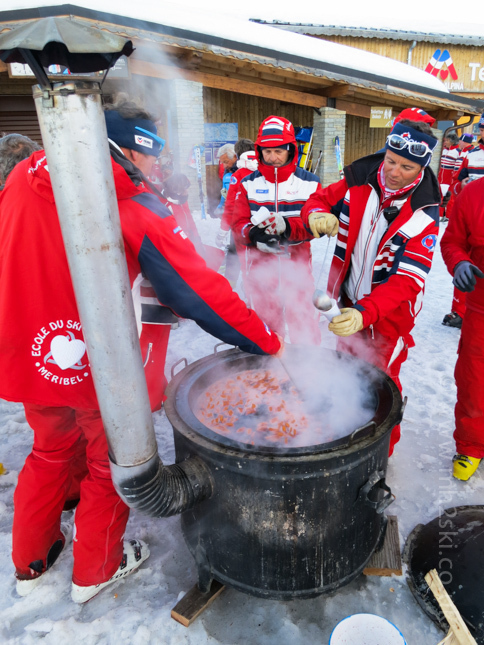 If you enjoyed this blog post, you might like to read another article about a completely different subject from last winter about skiing over the Half Term holiday period, click here for the link. Feel free to share away on Facebook, Twitter and Google+ by using the Social Media icons. Or leave a comment below, it's always great to hear from you. 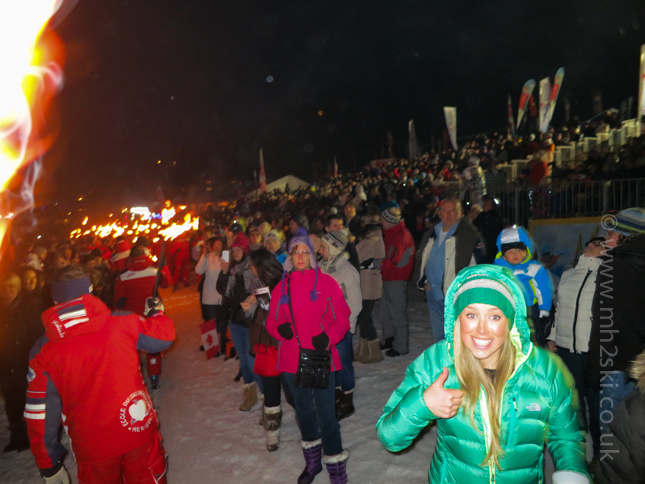 Did you attend any of the races here in Meribel, or watch them on TV. Next up, the Easter holidays start in a few days, stay tuned. Martin..... hick (damn Vin Chaud and lotions and potions).